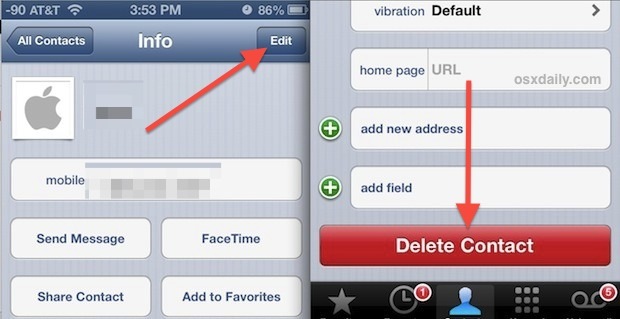 Need to delete a contact from the iPhone? Maybe you want to delete all contacts from the iPhone, iCloud, OS X, iPad, and everywhere else they appear, so that you can start anew with a completely blank address book? You can do both easily and quickly, and while deleting a single contact is quick and easy from iOS in the Contacts app, as of now the only way to delete every single contact in an expedient manner requires the usage of a Mac. Before proceeding, it is highly recommended to take a moment to back up the Contacts first with iTunes or iCloud, or through the Contacts app within OS X. If you do not back them up, you will permanently lose the address book data. On some occasions you can recover deleted contacts but due to variables with the process it may not work, thus it’s best not to rely on that. Also, this is not the ideal way to remove duplicates, and if you’re just trying to manage a bunch of repeat entries of the same individual in the address book, recall the merge duplicates feature that will do exactly that for you. Try that first, though it’s not bulletproof and you may need to manually go through and either merge or trash the remaining repeats. Because the Contacts app on the Mac syncs to iCloud, all of the contacts that you have removed in OS X will be deleted on the iPhone almost instantly. Because this is not only deleting the contacts from the Mac, iPhone, and iCloud, there is no retrieving the address book again. Be absolutely certain you want to truly remove everything or else you will irreversibly lose all names, phone numbers, and data. 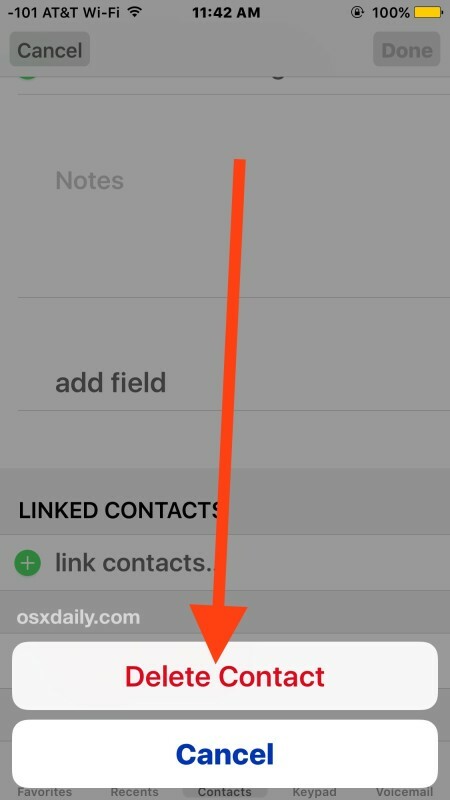 You can also delete contact cards directly on the iPhone itself, though it must be done on a per-contact basis as there is currently no way to bulk delete more than one individual. This makes it a slower process than the previous method. Obviously this per-person approach is much slower than the desktop approach version, which is why we’re listing it second despite the convenience of being on the device itself. Presumably there will be a feature that allows multiple cards to be deleted from the address book in a future version of iOS, but for now the one-by-one approach is all that’s possible without going all out and erasing everything off the iPhone by resetting to factory settings. The downside to that approach, other than losing everything, is that once the iPhone is hooked up to the same iCloud account again, all contact data will just resync back onto the device. 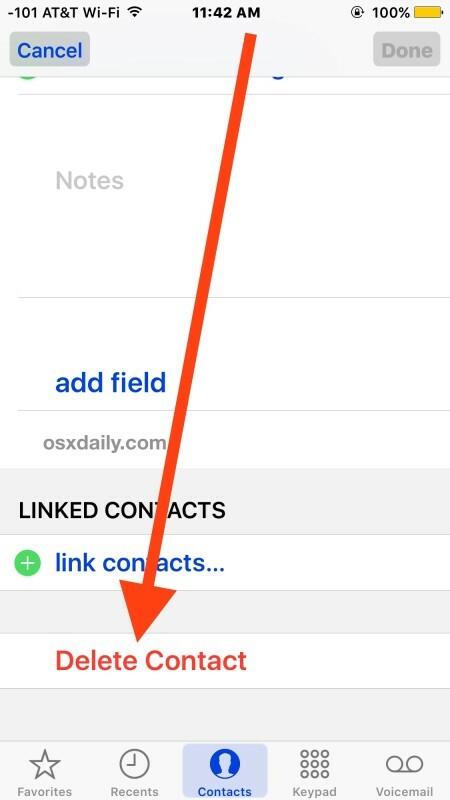 Know of a better way to remove information from the Contacts address book of iOS? Be sure to share it with us in the comments! Agreed, particularly for managing contacts on the iOS devices themselves. It’s frustrating if you’re not around a Mac and want to clear out many contacts at once. iCloud.com also offers the ability to delete multiple or all contacts. By going to icloud.com from any web browser, you don’t need to be near a Mac now to delete contacts from iCloud. Settings->GMail/Yahoo->Contacts. If it shows green, turn it off. This will ask your permission and if you say yes, it will remove all the contacts it imported from your email system. If you’re on a mac, go into the “Address Book” app, and make sure your address book is clean, as you want it. 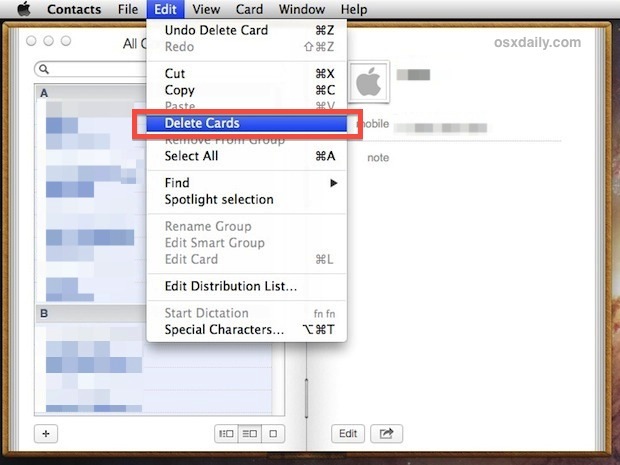 Then, shift-select all of the cards in your address book, and delete all cards. 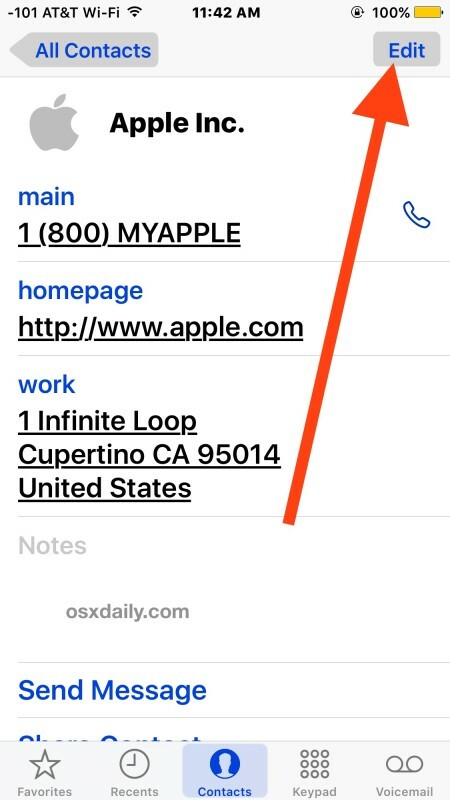 Then, when your address book is empty, sync your iPhone using the advanced feature of replacing the contacts on your iPhone with the contacts in the Address Book on your computer (currently empty). This deletes all the contacts off your phone. Then, back in your Address book on the computer, import the archived copy of your contacts that you just saved to your desktop. Then, sync your iPhone again, again using the advanced feature of replacing the contacts on your iPhone with the contacts in the Address Book on your computer (now refilled with your archived contacts). Done. Replaced with clean contacts list and deleted duplicates from multiple imports/merges. Great tutorial. Using iCloud is much more comfortable for contact deletion. My iPhone imported every Face Book contact I have into my phone contacts! Many don’t even have a phone no. and those ones w/o phone numbers have no red delete option at the bottom. I would like to unconnected with FB for my phone contacts! Can anyone help? Hi…on some of the individual contacts when you press edit it doesn’t give the delete contact option? How can I delete it? easier way. These instructions are from an iPhone 7s running iOS 10.2.